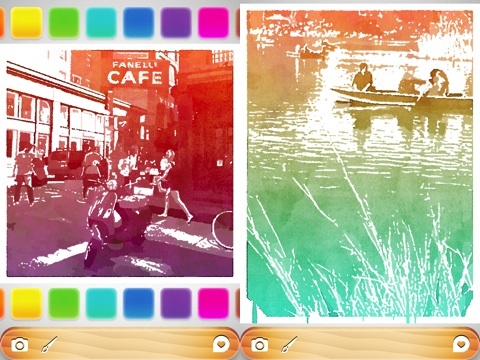 The Popsicolor iPhone, iPod Touch, and iPad app from Tinrocket converts your photographs to digital watercolors. The striking modern popsicle logo and fun graphic touches add a cool splash. When you open the Popsicolor app, the menu bar plops to the bottom of the screen, and a lightly colored peanut on a rocket ship in black and white serves as the background. The graphics are clean, modern, and sophisticated. The menu bar has just three icons that provide the tools and functionality of the Popsicolor iPhone app–a camera, a paint brush,and a heart icon. You choose a photo from your iPhone library, shoot one from your camera, or paste one from the clipboard. You are entertained during the processing time with the witty “Unwrapping, making a mess, cleaning a mess” phrases on the screen. The image converted is subtly colored with the darker areas holding deeper color and the light reflecting areas of the photo lighter and brighter. A palette runs across the bottom and top of the screen in bars. You can swipe your finger across the bar to access the ten colors. You touch a color on the top, and the upper part of the Popsicolor image turns to that shade. You touch a color on the bottom, and the bottom part of the image reflects that gesture controlled adjustment. After each touch on a color, the photo automatically processes. The cute names of the colors reflecting the ice cream branding theme fill the screen with the positive vibe of “Cotton Candy, Tangerine, and Boysenberry.” A recommendation to improve the experience would be to include an icon to select when you are ready to process. The paint brush icon gives you a chance to adjust the focus, pixel size, and turn over color selection duties to the Popsicolor iPhone app. The focus can be minimal, natural, or light. A clear, brief description describes each of these choices that impact the texture and light of the watercolor. You can select from several pixel sizes for the best quality of the image to save and share. The pixel selection feature is superfluous and will not necessarily be a feature needed by most users–except someone who knows how to copy a photo to a clipboard and paste it into the Popsicolor iPhone app. If you want to leave the color mixing to the Popsicolor iPhone app, then you can touch remix colors for a fresh perspective. When you complete the watercolor version of your photo, you can save to your iPhone libraries, send via email, or copy to clipboard. If you are addicted to one-touch sharing to Facebook and Twitter, you will be disappointed, but you can consider it your opportunity to learn how to use the clipboard. 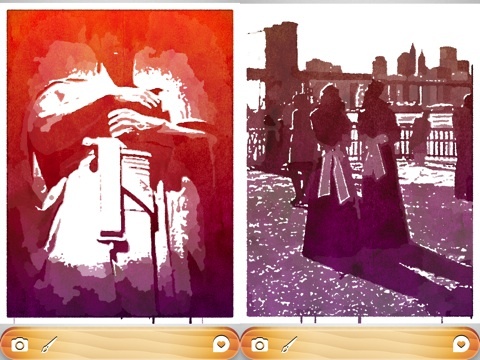 The Popsicolor iPhone app provides a neat, fun, and simple experience and product for a fair $.99 download. Enhanced social sharing features and streamlined processing functionality would certainly improve the rating, as the Popsicolor watercolor is lovely and appealing. AppSafari review of Popsicolor was written by Jenni Ward on July 10th, 2012 and categorized under App Store, iPad apps, Photos, Universal, Video. Page viewed 3793 times, 2 so far today. Need help on using these apps? Please read the Help Page.